1929: White circle with "Allah" written above "Akbar", surrounded by a dark green ring, then a red ring and then a black ring. 1929 to 1965: Black, red, dark green roundel, with in 1945, additional green, red, black stripes, as well as roundels on the wings. 1966: An isosceles triangle one point at north (12 o'clock), divided equally into black to the right, red to the bottom, and dark green to the left. Set on a white circle, the points of the triangle not touching the circumference. The Afghan Air Force was officially established in 22 August 1924 in order to be destroyed in 1929 and reformed in 1937. There are very few sources about its roundels, with quite a lot of contradiction among them. Cochrane & Elliott (1998) reported the 1924-1929 roundels as a black and white arms (opposed colors to the arms on the 1919 flag) on the fuselage and rudder, while an inscription "Allah Akhbar" was written below the wings. Cochrane & Elliott (1998) also reported that after reorganization in 1937 under British influence, the Afghan Air Force used a tri-color roundel (inside-out black-red-green) and fin-flash at the same order of colors. Some aircraft may have also tricolor stripes on their wings. Cochrane & Elliott (1998) showed the roundel a with thinner green circle (2:2:1). However Jane's 1945 shows the roundel as red-black-green with a thinner black stripe (2:1:2) and (inside-out) green-red-black stripes on the rudder. I couldn't find a photo from this era but, as far as I can recall, Cochrane & Elliott (1998) is the correct one. The 1937 roundel was kept when it became the Royal Afghan Air Force in 1948 while in the 50's the rudder stripes became the fin-flash. This image shows the roundel as it was used. Mohammed Nadir Shah, the victor in the 1929 insurrection, changed Afghan colours from largely red to red, green and black, symbolizing bloodshed for independence, hope for the future and the country's dark past. 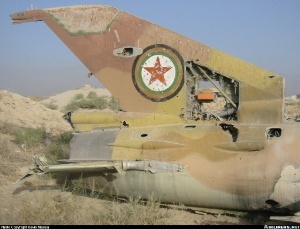 A 1:1 fin flash with those colours was used as fin flash between 1937 when the Afghan Air Force was reformed and 1967. In 1967 a new roundel was introduced, and used also as a fin flash. 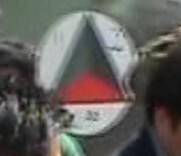 David Prothero reports it as "an isosceles triangle one point at north (12 o'clock) divided equally into black to the right, red to the bottom, and dark green to the left. Set on a white circle, the points of the triangle not touching the circumference." Cochrane & Elliott (1998) showed it with red on left, green on right and black at the bottom. They also reported Arabic letters on the white circle (too small to identify in his image). This roundel was in use until 1979 (even though the Shah was overthrown in 1973) and according to Cochrane & Elliott (1998) it was re-introduced in 1995. The Roundels of the World website shows this roundel (with a third possible arrangement - black on the right, green on the left and red on the bottom), with the Arabic numbers 1,1 and 5 as the Roundel of the Northern Alliance (and therefore also the current roundel). A capture from a report on "The World" on BBC4 TV (15 June 2004) shows that this roundel appears to be in use now. The "roundel introduced in 1967; also used as a fin flash, is seen here: http://en.wikipedia.org/wiki/Afghan_Air_Force#mediaviewer/File:Roundel_of_the_Afghan_Air_Force_(1948-1979).svg. The three letters are the initials of Afghan Nero-e-Hawa (Afghan air force). In use from 1948 until 1979 (according to the image caption). In Flaggenmitteilung no. 108 (April 1985) I found four air force roundels, including Afghanistan. It is possible these emblems changed, especially that of Afghanistan. Cochrane & Elliott (1998) reported a new roundel and fin flash in 1983 as a red star within a circle of the national colours. The image is too small to identify the order of colors. Wheeler (1986) reported this roundel as that of the Afghan Republican Air Force since 1979 with the colors of the ring as black-red-green. The Roundels of the World website reported the ring as green-red black. The Air Force Badges website shows a narrow green-red-very narrow black set of rings. correct (even thou the red seems to have faded). The air force roundel currently being used by the loyalist Northern Alliance. I would like to know when did the current roundel (as used by the loyalist Northern Alliance) appear? It looks identical to the 1966 one mentioned above by David Prothero, only removing the bottom, red area of the triangle (hence leaving a spearhead shape). A detailed French television report about Cdr. Massoud (Massoud l'Afghan by Christophe de Pontilly) showed a couple of times the roundel on helicopters transporting him, but I am not sure whether the central element was a spearhead or simply a triangle (half black, half green). The current roundel (mentioned to be in use since 2006) is seen here: http://en.wikipedia.org/wiki/Afghan_Air_Force#mediaviewer/File:Afghan_National_Army_emblem.svg. The three letters are the initials of Afghan Ordou-e Melli (Afghan National Army). This is so because the Air Force is a branch within the ANA.